Martine Syms is an artist. Martine Syms uses video, performance, text, and installation to address representations of blackness. Her research-based practice frequently references and incorporates theoretical models regarding performed or imposed identities, the power of the gesture, and embedded assumptions concerning gender and race. In her multivalent creative practice, Syms combines conceptual strategies and research-based approaches with the traditions of queer, feminist, and black radical thought. Many of her video works utilize or reference footage from television shows, advertisements, animated GIFs, surveillance footage, Vines and other digitally-circulated formats: image is recombined to make new meaning, and scenes of self-expression and self-fashioning point to the blurred line between looking and looked at in a digital era. In her videos, Syms forges a distinctive aesthetic that takes up the tropes of soap opera, documentary, and meme. 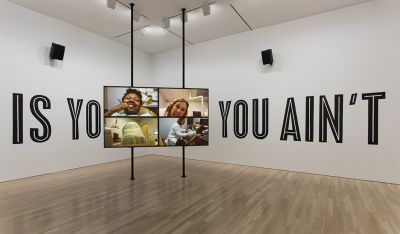 She seamlessly integrates contemporary forms of communication into her art; two recent exhibitions allowed visitors to text with a chatbot to control the selection of video, audio, and graphics appearing on the exhibition’s monitors. Recently, her show Projects 106: Martine Syms at the Museum of Modern Art, New York caused a stir in the art world with her experimental use of media through the creation of an augmented reality app. Her exhibition in the Secession’s Grafisches Kabinett will mark the premiere of a new work created for the occasion.